Your Mustangs Exhaust will never sound better! 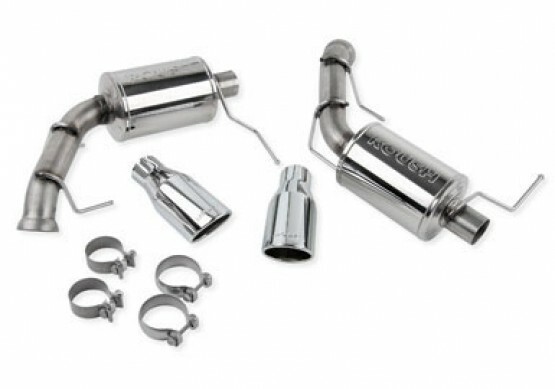 The ROUSH Axle-Back Mustang Exhaust Kit with Round Tips, designed to fit the 2011-2014 Mustang GT & 2011-2012 Mustang GT500, is an innovative exhaust system from ROUSH that features an open-chambered designed muffler (as opposed to conventional fiberglass-packing). The result is an aggressive sound that is unique to ROUSH, increased longevity (with no fiberglass packing), and increased horsepower & with additional airflow. Another added benefit of this system is the lack of the in-cockpit boom normally found with performance exhaust systems at cruising speeds. Not only does this system sound awesome, it looks great as well! The round tips are made from high-quality 304 stainless steel and are finished with a chrome flashing process, and are embossed with the ROUSH logo on the end. This will let people know your Mustang roars, and lets them know you mean business! Conventional chrome plating uses layers of bonded chemicals to achieve its shiny appearance, which are susceptible to cracking and flaking especially when exposed to high temperatures (like exhaust produces). However, the chrome flashing used in this system is bonded micro-porously to the metal surface, and is as a result impervious to cracking from localized damage. This method of chroming is also resistant to heat color change. This exhaust kit mounts to the factory mounting points, and includes all necessary hardware and instructions. This makes for easy installation to get you back on the road in no time. 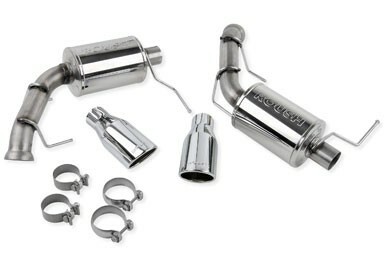 The mufflers and inlet pipe are made from 409 stainless steel for increased durability. This kit carries a 3 year limited warranty. This Mustang Exhaust is quick and easy to install and uses the factory hanger mountings, so you don't have to fabricate your own. This kit also features new OE-quality spherical clamps for a better fit. This kit has no negative effect on emissions.